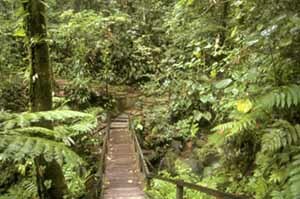 One of Dominica's most popular and picturesque walks. The easy walk to the Emerald Pool is a loop trail of less than 1 mile that takes about 20 minutes to complete. .Emerald Pool, only a 10-minute walk from the road. This is a favorite stop on the way from Roseau to the Carib Territory. Emerald Pool is located 3.5 miles northeast of Pont Casse on the road to Rosalie and Castle Bruce. Take the left fork that goes to Castle Bruce. The small parking lot is 0.5-miles on the left. Reached by a half-mile loop trail, the Emerald Pool is by far the most accessible spot in the entire Morne Trois Pitons National Park. Emerald Pool is actually a waterfall-fed pool that appears bright green in the tree-filtered sunlight. The forest here technically falls into what is known as a transition zone, not true rain forest or montane forest. The majority of plants are young trees--not shrubs--which create a massively thick canopy, prompting many vines to grow upwards from ground level. Others, established in the tree tops, send down their roots. Epiphytes are especially fond of the filtered sunlight, and the trees are covered with them. Both the agouti, a guinea-pig-like rodent, and the nocturnal manicou, a small opossum, live here, but you are far more likely to spot birds, particularly hummingbirds, and hear the song of the mountain warbler.